Dream Ahead came out on top in a thrilling three-way finish with Bated Breath and Hoof It in the Betfred Sprint Cup at Haydock Park on Saturday. The 4-1 favourite was on a recovery mission following a lifeless display in France on his latest appearance, but looked much more like the horse who was so impressive in the July Cup. David Simcock's star turn, ridden by William Buick, hit the front inside the final quarter-mile and although he hung both left and right in the closing stages, the three-year-old managed to fend off Bated Breath by a nose, with a further head to Hoof It, who put in a late challenge. The placings remained unaltered following a long stewards' inquiry into possible interference involving the first and third. Buick said: "He's got a big head, and that helps in a finish like that. It's a very good training performance to get him back from his disappointment last time." Simcock added: "It's a massive relief as after France we were scratching our heads. We thought we had him great in France and we thought we had him great today. We rode him far more positively and he battled well and did everything well. "It's great for the horse to enhance his reputation and I probably won't see another horse like him. It's very special and this means as much as the July Cup, as we're bouncing back. "There's only two options open to him now. 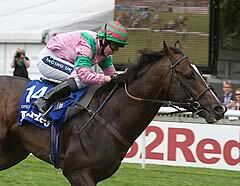 We could either go to France for the Prix de la Foret, or run at Ascot (Qipco British Champions Sprint Stakes). People might ask why I'd want to go back to seven furlongs (in France) but, on the other hand, why drop back to a Group Two at Ascot? "I hope he stays in training next year and if that's the case, I don't think he would go for the Breeders' Cup this season. There will be discussions between his owners and myself." Hoof It's jockey Graham Gibbons was in no doubt he was an unlucky loser. He said: "I was carried across the course and it definitely cost me the race. There was only a nose and a head in it." Connections of Hoof It are considering launching an appeal after he finished an unlucky third in the Betfred Sprint Cup at Haydock on Saturday. The Mick Easterby-trained sprinter, jointly owned by golfer Lee Westwood and his agent Chubby Chandler, was a nose and a head behind the winner, Dream Ahead, and runner-up Bated Breath. Easterby's four-year-old was, however, forced left inside the final furlong by Dream Ahead, after which a protracted stewards' inquiry was called. The placings remained unaltered, but Easterby may still contest the decision. He said: "I thought he was very unlucky, and we are considering appealing. "There was definitely interference, and the stewards said they couldn't be certain the interference affected the result. "But when you are talking in terms of a head and a nose, it is very, very harsh. "The stewards have been a bit timid, for me, but on the other hand, I wouldn't want to be a steward." Of the possibility of Hoof It running in the William Hill Ayr Gold Cup, in which he would carry top weight of 10st 5lb, on Saturday week, Easterby added: "I haven't made my mind up yet."